This digital TV antenna amplifier will allow your TV antenna to pick up more local TV channels and enhance the clarity and reception of the broadcast TV channels available in the area. This little handy device greatly help boost the digital TV signal level to eliminate channel drop-outs due to long antenna cable runs or use of RF coax splitters. It works well with any brand of indoor passive non-powered type digital TV antenna and can pick up both UHF and VHF digital signals. This indoor antenna is suitable for indoor use. This indoor TV amplifier is featured with 15-dB high gain from the internal booster used. Must-have gadget for remote or rural area with weak TV signal. Enjoy uninterrupted and improved picture quality that your TV normally will not receive with the available signal strength. Designed to enhance the performance of your antennas in areas that have a low signal. It improves the RF amplification between the receiver and the antenna so that you can get an improved reception. This indoor amplifier increases range and delivers a crystal clear TV signal to HDTVs so viewers can get more broadcast HD TV channels in high definition than with an antenna alone. 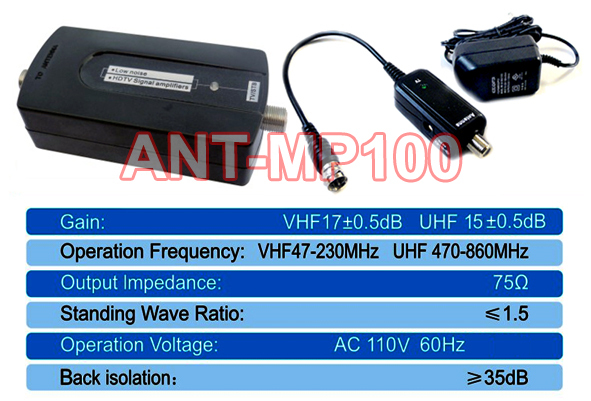 This TV antenna preamplifier works best for persons in weak signal areas and is subject to overdrive if used in areas with fairly strong signals. Preamplifiers are also used if you anticipate distributing your signal with a digital splitter to multiple outlets throughout your house as splitters reduce the signal strength available at each output. This TV signal amplifier adopts low-noise RF amplification circuitry to maximize the reception strength and provide pure TV signal free of interference. The internal booster circuitry converts any low power, low frequency RF signal into higher frequency at higher power one but with super low noise, typically 1 dB only. and display the broadcast TV channels on TV with clarity and stability. Connect antenna to the Antenna Input port of this amplifier first. Connect the ï¿½TV/STBï¿½ output end of the amplifier with one end of the power injector and connect the other end of the power injector into the antenna input of your TV. Plug in the AC/DC power adapter to the power injector and wall outlet. This amplifier can be used anywhere that has low signal reception and is especially useful for rural or unincorporated areas. It improves the reception range and enhances any non-powered antenna using the latest amplifier technology. This booster enhances non-powered antenna using the latest digital amplifier technology and also help eliminate the TV channel drop-outs due to long antenna cable runs or use of RF coax splitters. This digital antenna signal booster helps improve the reception range and available channels, and enhance any non-powered antenna using the latest amplifier technology. Boost the TV signal strength to eliminate channel drop-outs due to long cable runs or use of RF coax splitters. This antenna signal booster extends the reception range and receive more available channels. A great solution for fixing the TV picture problems of noise, snowy picture or interference. Supports both analog and digital broadcast TV signals. Works well with any brand of indoor passive type non-powered TV antenna. Active type aerial RF amplification with active power line injector. Maximum 15 dB gain output with super low noise 1 dB only.